Val McDermid is a prolific writer, probably best known for her highly successful Tony Hill novels (adapted for TV as The Wire in the Blood series, although if you have ever watched them I can assure you that the books are far better). I’m sure McDermid could get along very nicely indeed just by knocking out a new Tony Hill book each year, but every now and again she likes to challenge herself – and her readers – by producing a stand-alone novel, in much the same way that Ruth Rendell periodically gives herself a break from writing about Wexford. As much as I like the Tony Hill books, I have found that these one-off stories are often among her best and most interesting works; The Vanishing Point has proved to be no exception. The novel opens with a taut, gripping account that will leave anyone who has ever been responsible for a child feeling profoundly uncomfortable. In the middle of Chicago’s O’Hare airport – one of the busiest travel hubs in the world – we meet Stephanie Harker and five-year-old Jimmy, setting out to change planes en route from London to a holiday in California. Stephanie hates airport security; she has metal pins in her leg from a car accident some years earlier and so inevitably sets off the metal detectors every time she goes to catch a flight. When the alarms sound this time, she lets herself be shepherded into a Perspex box for the humiliating pat-down she is now accustomed to, giving Jimmy a reassuring thumbs-up as he waits patiently with their belongings on the other side of security. As Stephanie watches him, however, a uniformed man calmly approaches Jimmy and starts to lead him gently away. Panicking, Stephanie screams for help and tries to break out of the box after the boy – in post 9/11 America, however, all this results in is her being tasered and hauled away for interview as a potential terrorist. As Stephanie recovers, she manages to convince the FBI that she is the victim rather than the criminal, and gradually begins to tell her back story in the hope that it will help find Jimmy. As you might expect, it is anything but straightforward. She is the boy’s guardian, his real mother being the late reality TV star Scarlett Higgins, who Stephanie became close friends with after being appointed as Scarlett’s ghost writer. Scarlett – sort of a cross between Jade Goody and Katie Price – had a carefully cultivated public persona of a dense but loveable bimbo, but Stephanie is surprised to discover a shrewd and intelligent woman beneath the bleached blonde hair. Gradually she gets sucked into Scarlett’s world, writing multiple books and even branching out into producing copy for magazines about Scarlett’s carefully orchestrated wedding and childbirth. Could this complicated and unusual life be the reason that Jimmy has been kidnapped from under Stephanie’s nose? McDermid was a journalist for a long time before becoming a novelist, and I get the impression that her background has been something of an inspiration for writing this story. So many aspects of modern tabloid journalism – celebrities, stalkers, phone-hacking, choreographed photograph opportunities, manipulation of and by the media – are present here, and brought together to produce an effective, absorbing and appropriately over-the-top thriller (which works even if you pay little attention to such things in real life). It is an enjoyably cynical take on this world and everyone involved in it. Scarlett was a very interesting character, and while I liked the idea of having a ghost writer as our window on this world, I did wonder why someone who is experienced at working with celebrities and writing books designed to portray the image of their choosing to the world would be quite so naïve as Stephanie was at times; she sometimes just accepts things at face value, perhaps a little too readily for someone in her position. But this aside, McDermid has one again produced a compulsive page-turner of a book that successfully manages to misdirect and confound the reader time and again. Yes, I saw some of the plot twists coming, but I easily got caught out by several others that kept the story cracking along well right until the end. 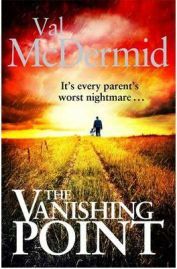 If you have never tried one of Val McDermid’s books, you could do a lot worse than starting with The Vanishing Point. With thanks to the publishers for providing this review copy. No Comments on "The Vanishing Point"